On Friday, there December 11, I delivered a lecture to Alan McCusker-Thompson‘s 3rd year students undertaking a BA in Commercial Music at UWS in Ayr. The module in which this lecture was included focuses on Popular Culture and Music. My talk therefore had to show how the internet and Web 2.0 in particular has enabled, through open sourcing etc, the democratisation of cultural construction. I chose to concentrate in the presentation on the development of web and its influence on a)distribution of music and b) communication of established and emerging artists. I chose two case studies as a pretext for debate about how the web and its feature is currently used by artists to promote their work. More than 40 students have attended the talk and judging from their questions and reactions, they have enjoyed the presentation but also found it intriguing and thought-challenging. BSc (Hons) in Sport Coaching and BA in Sport Management. I decided to prepare a powerpoint that covered in writing more than I could speak in an hour. As I upload all my slides from lectures that I give, I thought this might help students understand better the subject. As usual, I have enjoyed the experience of delivering a lecture to students from my own university and I have appreciated their questions. All the thanks go to Scott Barclay for having invited me today! it shows that expanding the course from one week to two has benefited the students. Some of them have indicated that they learned much more by actively using new media such as posting their in-classroom assignments and exercises on Posterous, WordPress and on this Wiki space. Additionally, the live video guest lecture was well received – as an alternative method of delivery and not only – . Finally, the company visit at Netlog in Gent was again inspiring. The evaluation report is below. Thank you Katho and thank you to my students! This Monday (January 18, advice 2010) I’ve been to London to apply for the Canadian visa that would enable me to go to the Vancouver 2010 Olympics. My friend and PhD colleague, Jennifer Jones, decided to join me for the day so we’ve agreed to spend our afternoon around the future London 2012 Olympic area, observing the development of East London, discussing changes from our last visits to the city and imagining how things would look in two years time from now on. In order to reach the Olympic area, we have decided to use public transportation for two reasons: it is the cheapest way around London (except for maybe walking when distances permit it) and it is a means highly recommended to use during the actual time of the Games, when streets tend to me busy, crowded and often jammed otherwise. However, instead of taking the rather direct route from the centre of London to Stratford, which would have left us off just where the Olympic stadium is now being built, we chose to get off to Bromley-by-Bow, a station that to us looked to be in walking distance to the future Olympic venues. Our half-day exploration was revelatory in the sense that we saw the border of the regeneration project planned for East London and we walked along the border of the future Olympic area with the East London as it used to be. From a distance, signs of improvement were easily noticeable: council estates newly painted, new and modern buildings at different stages of construction rising invigorating the grey landscape. Also bigger advertising outdoor banners were also to be seen as well as a big number of cranes working tirelessly. However, immediately upon leaving the Bromley-by-Bow underground station it was not the colourful buildings that caught our eye but rather the busy motorway, the industrial suburban look and the lack of a close and easy connection with the future Olympic stadium. It took us quite a while to find a safe place to cross but once we found it we also encountered the first sign of a community reaction (or at least that what we’ve considered it to be) in the form of printed poster announcing closed lanes and indicating (using A0 size printed and laminated Google Satellite Maps) alternative routes to reach the Olympic venues. Entering Pudding Mill Lane, we left behind a mixt landscape for a territory clearly marked as belonging to the Olympics. The streets were brand new, a Porche shop was just at the corner of the street where brand new luxury apartment buildings were rising on both sides. From behind branded walls sounds of construction work were filling the air. In places, electric wire fences were protecting and revealing the areas where works to the connecting routes from the motorway were continuing. A particularly interesting sight was offered to us by the welcoming signs for the workers which were advising them to stay safe. The Olympic Park thus, as accessed from an indirect route, looked like an area where visitors were not particularly expected, where locals have accepted the ongoing works and where security was highly valued. Seen from the outside, there is still little so far to hint into how East London will look in two years time. However, the hints reveal a promising landscape with vibrant architecture, clean designs, and memorable images. Right now there is a visible contrast between the old and the new but the hopes, I believe, are that the new will, in time, enhance change and enable further beautification projects in the entire area. These, in time, will lead to an aesthetically coherent and cohesive neighbourhood and to a renewed and rejuvenated community, more connected to its space through its space. Barcelona and its Olympic Port, which I have visited last year, stand as witness that both coherent looks and renewed communities around former Olympic venues can be Olympic legacies. There, a beautiful neighbourhood emerged in the place where the Olympic Village once stood. It is only for the Olympic passionate that the streets and parks in the area could still tell a story about the Games. Otherwise, for the regular visitor, the Olympic Port in Barcelona provides a memorable experience in a part of town with a more recent history of change. But such results as those now visible in Barcelona can be achieved only with the collaboration of the people that choose to live in the former Olympic areas and with a continued support that goes into continuing the regeneration projects started for the Olympics. The path for change has been already created and the potential for change is high however it needs collaboration, participation and engagement from that same community the London 2012 Games experience is supposed to rejuvenate. The East London we left behind and kept contemplating while comfortably sitting in the over-the-ground train to Canary Wharf looked homely, exciting and welcoming> It also provides less of a contrast than the images we’ve seen from Bromley-by-Bow. The stadium too, said to have a demountable lightweight steep and concrete upper tier aimed at reduced its size after the games, blended better with the curves of its surroundings while all the other works going on were hardly noticeable. In terms of Olympic construction and development, two years might seem a little but the changes they can bring are enormous. Every Olympic host promises something new, but unlike the grandeur of Beijing I for one have witnessed and have been impressed by in 2008, London promises to offer what Barcelona did in 1992: a breath of fresh air, an opportunity for rejuvenation and for reinvention. I really have to wonder whether this writer has any idea of what he is talking about. Barcelona’s new housing, so-called legacy, was not built with the collaboration of those living there. Some 55,000 people had to leave to make way for the harbour developments which brought a big fat profit to developers and landowners like Samaranch! As for the new blocks of flats that are going up in the Stratford area, they have nothing to do with the Olympics, they were being built anyway. And what are you talking about when you refer to newly painted council estates? I have no idea where you are referring to but housing does get painted without reference to the Olympics! Why were welcoming signs for workers particularly interesting? What evidence was there that local people had ‘accepted ongoing works and security was highly valued’. What does this mean? You mean local people have a choice? If local people asked would the Olympics stop blocking the streets? Actually you just have to put up with the traffic jams which will be getting worse. Perhaps you think electric fences are all the rage in East London! Bizarre stuff! Thank you for reading my blog and leaving a comment. I will try to give an answer to some of the questions you have raised. You are indicating that the blocks I have seen being built in the region surrounding the Bromley-by-Bow and Pudding Mill Lane are projects that have no connection with the upcoming Games. I believe that, if that is a case, that is a good sign. In my view Olympic developments are taking place at the same time with other projects aiming to regenerate East London. With regards to the signs I have seen, located close to the Pudding Mill Lane over-the-ground station, I have perceived them to be addressed to the workers rather potential visitors. After all the signs are saying “Welcome to the Olympic Park. Please ensure that you and your workmates work safely”. As for the acceptance of local people, the post renders my perceptions and impressions after a walk around the sites of the future Olympics. I haven’t interviewed anyone as that was not the aim of my visit. Having said that, I haven’t seen any anti-Olympics graffiti or posters either around those said underground stations and the streets between them. On the contrary, I have found a map rerouting people to the site. The picture of that map is on the blog. Finally, with regards to Barcelona, I haven’t made reference to the people who used to live in the Olympic Port area before the 1992 Games. I haven’t been there then. What I made reference to was to how Barcelona looked now and how safe and appealing for tourists the former Olympic Village was. However, I would like to know where from do you have the number of displaced people from Barcelona. Every transformation and regeneration project brings challenges and involves change. Building sites in urban areas already condensed do most of the time result, among others, for a limited period of time, in traffic congestion. But if East London in 15 years from now on, will look like Barcelona’s Olympic Port 15 years after the Olympics, I believe that the inconvenience and effort might be worth it. Having seen Barcelona 2009, and having seen London in 2010, all I can say is that I believe Barcelona’s result is desirable for a city. Over £9billion is being spent (well actually more because all sorts of organisations, councils, waterways boards, environment agencies, etc, have Olympic budgets) so plainly there will be some changes! The questions are, 1. are the claims of benefits true and 2. who benefits? Re 1. Some examples: 2012 claims it will create the largest new park in Europe for 150 (sometimes they say 100) years. This is not true. They say there is a housing legacy from the athletes’ village but housing was going to be built there anyway so why call this a legacy? They say they will create a new cycle track but they demolished one so they are just replacing what they demolished. They say there will be thousands of new jobs but actually these claims are tendentious by their own admission and will require further spending. Jobs are created whether or not there is an Olympics. These are the public relations tricks of the trade. To support a project like this the government makes the usual claims and puts out the usual publicity. So what is the point of your statement that it is a good sign housing is being built regardless of the Olympics. Sure. But as this has nothing to do with the Olympics it should not be claimed as a benefit. Why mention it in this context? Measuring the costs and benefits is criticial to understanding these projects and just lumping things together provides no real insight into the impact of the programme. Those promoting these events make all sorts of claims which turn out to be rubbish and there is extensive literature to that effect. In London, before bidding for the Olympics, the government even commissioned its own report, Game Plan, which said exactly that and then ignored it! Re 2. you make general comments about the results of regeneration programmes and their ‘challenges’. ‘Challenges’ for many means pain and loss. I’m not just talking about traffic congestion! I wrote about that because it featured in your article. Regeneration is a great label to stick on a project and makes it sound touchy feely and good to know but once again it is necessary to see who gains and who loses. The London Olympics, like other projects of this kind, involve compulsory purchase, ie the forcible take over of land and assets and their transfer to others. Compensation may be paid but often does not reflect real values. In Barcelona there were some direct evictions, you can read the COHRE report into Olympic evictions. There were also the indirect evictions which resulted from higher land values and speculation. These resulted in widespread displacement of thousands. Replacement affordable housing was not provided to make up for the losses. Visitors can be impressed by the shiny new buildings or the rassmatazz of the sports event which is all over in three weeks. They have no knowledge of the circumstances of those displaced or what it cost to produce these things. The issue here is how change occurs and who benefits. You say you are impressed by Beijing which saw around 1.5million people evicted to make way for this event and then you refer, in the case of Barcelona, to the collaboration of those living there. I am having some difficulty being impressed by this or by this alleged collaboration. 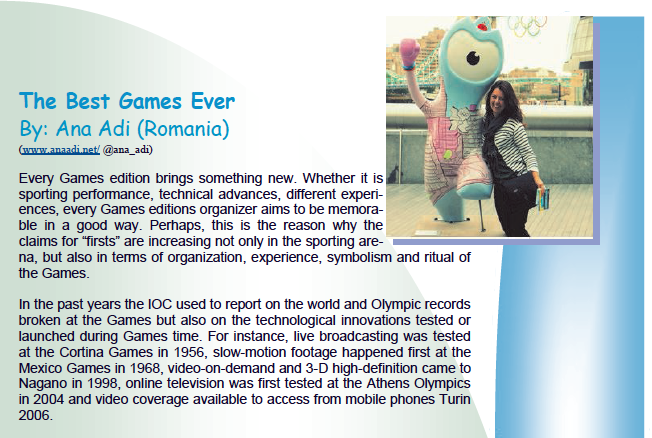 There is extensive literature on the Olympics, some is referred to on the Games Monitor site, including the Game Plan report. I have no doubt that if you had interviewed people on your visit to Stratford you would have found plenty who would have been impressed and pleased to see that the Olympics was coming to Stratford. There would also have been those who would not have been happy! I have to declare an interest as I was evicted to make way for the project and went through the compulsory purchase process and have thus taken some time to look at mega-events like the Olympics. Of course you might then dismiss the validity my arguments because of that experience! As they say in Barcelona ‘A luta continua!’ At least I think that is how they say it.